Latin American reservation. The pool consists of players from Argentina, Brazil, Chile, Uruguay and Bolivia. Some of the most profitable poker rooms out there are restricted to a certain part of the world where the players are not that experienced. The Aconcagua Poker network is a bright example of that. It accepts players from Argentina, Brazil, Chile, Uruguay, and Bolivia. If that sounds interesting, check our review and see what you can expect from the Aconcagua Poker network. Operating company Golden Dragon Superholdings N.V has the license in Curacao. The Aconcagua Poker network was established in 2009 with the sole purpose of providing a platform for players from Latin America. The company behind it is called Golden Dragon Superholdings and has obtained a license from the gambling commission of Curacao. While it’s not the most respected regulator out there, it is solid enough. In theory, Aconcagua Poker only accepts players from the countries we mentioned above. However, you could join the action, as will help you open an account and handle the transactions. The main currency of the Aconcagua Poker network is chips which are equal to 1 Argentinian Peso. If you want to convert that to USD, the rate is about 100 chips = $6.50. A small part of the tables at Aconcagua Poker is in Brazilian Reals too. It’s interesting that one of the major selling points is the Aconcagua Poker mobile version. It is available as a native Android app and allows you to play on the go. As a result, there are plenty of weak players who are simply having fun from their phone or tablet. This makes the games at Aconcagua Poker even softer. 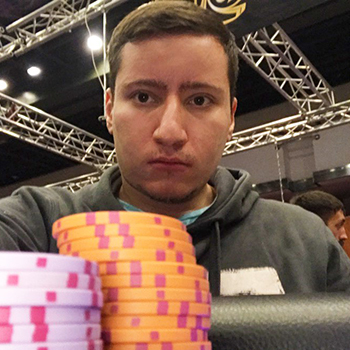 One of the downsides of the Aconcagua Poker network is that it is not very warm towards regular players. This is quite natural, as the operator is trying to protect the fish. As a result, Aconcagua Poker is a great side option, but you could have issues if you put all of your volume there. As many other platforms that are limited to one or a couple of countries. Aconcagua Poker can’t compare to the largest online poker rooms. Still, the operator managed to attract plenty of users from Latin America and there’s decent traffic. The reason for that is that all skins that operate as part of the Aconcagua Poker network share the player pool. High limits: you probably won’t be satisfied with the traffic at the higher limits at Aconcagua Poker. Your best bet would be to play at the $250 and $300 NL Holdem tables, as there is regular action during the peak hours. However, everything above that, as well as the higher PL Omaha levels run sporadically and you can’t rely on finding enough action on a regular basis. On the plus side, when the games do run, the players are dramatically worse compared to similar levels at the traditional poker rooms out there. An interesting touch is that the higher levels at Aconcagua Poker are actually anonymous. The other poker format supported in the Aconcagua Poker network is multi-table tournaments. If you expect some large buy-ins and tons of players, you will be disappointed. However, you will find plenty of soft guaranteed tournaments with buy-ins in the $10 - $20 region and a prize pool of $500 - $3,000. The best about that is the level of the opposition. You will barely find so many terrible players at the same place. However, the best Aconcagua Poker tournaments usually run in the peak hours in South America which is hardly ideal for European players. The poker client of the Aconcagua Poker network is developed by Connective Games. The company has quite the reputation in the industry, so the software runs smoothly. You could go for the flash version and play instantly, install the Aconcagua Poker mobile app for Android, or download the client on your computer. The last option is the best among them, especially if you intend to multi-table. Aconcagua Poker allows you to stack the tables in a couple of different ways and customize various elements of the layout. As already mentioned, Aconcagua Poker doesn’t really like regular players. As a result, additional software like Holdem Manager and Poker Tracker is not supported directly. If you insist on using such programs, you could go through hand converters. Tournaments: when it comes to multi-table tournaments, Aconcagua Poker charges 10% in most events. The Aconcagua Poker network doesn’t officially offer any way to get rakeback. However, we might have something if you’re interested. Drop us a line on Skype or contact us in any of the other ways listed on the website to learn more about it. How to register in Aconcagua Poker?